Craving unique brick oven Italian food at its freshest in Timonium, MD? Look no further and reserve your table today at Bertucci's to experience fresh, delicious food made by hand daily and fire-cooked until intense flavor is locked in. Renowned for perfecting the art of making brick oven pizzas & handcrafted pasta dishes, Bertucci’s is freshness you can taste in every bite. Our authentic Italian specialties have two important characteristics in common that our culinary teams take seriously: fresh ingredients & time invested to make each by hand. We use tomatoes grown exclusively for Bertucci’s and our roasted small-batch vegetables are fresh all day, every day. Our signature, scratch-made dough is prepared then “rested” for two days to achieve the perfect texture & taste. Bertucci’s features not only our signature pizza and calzones, but also delectable vegetarian and gluten-free options. Our kitchen is open, making our brick oven part of the relaxed ambiance and dining experience. So, whether it’s our signature pizza, mouthwatering pasta creations or one of our sweetly sensational desserts, we create magic within our brick oven, the heart of each Bertucci’s location. 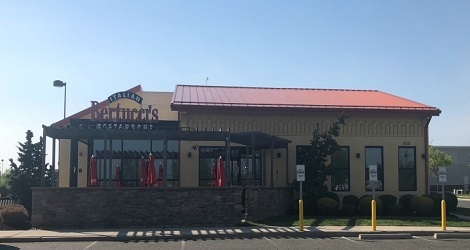 Convenient to Yorkridge Shopping Center and minutes from the Maryland State Fairgrounds, Bertucci’s is perfect for enjoying a relaxing or romantic meal, a quick and delicious lunch, everyday dining or special celebrations for groups, both small and large. Can’t join us at our table? Call ahead or order online for 2Go or delivery. Catering is also available, so we can come to you for your next special gathering. Looking for the ideal gift for friends, family, colleagues or neighbors? Bertucci’s gift cards are perfect and sure to please even the most discerning palate.